Blast off to the new International Space Station Mission Journal! Shuttle Endeavour blasts off Nov. 30th on mission STS-97 to Space Station Alpha! Space Shuttle Endeavour and the five-member STS-97 crew landed safely at Kennedy Space Center, Fla., to end a successful mission to the International Space Station. Touchdown occurred at 5:03 p.m. CST (23:03 GMT). While at the station, the astronauts installed the first set of U.S. solar arrays, performed three space walks, delivered supplies and equipment and became the first shuttle crew to visit the station�s first resident crew. The work performed by the STS-97 crew sets the stage for the installation of the station�s next major component, the U.S. Destiny Laboratory, in early 2001. Space Shuttle Endeavour landed at the Kennedy Space Center, FL, shortly after 6 p.m. EST this evening, completing a successful mission to the International Space Station. Commander Brent Jett and Pilot Mike Bloomfield steered the spacecraft to a picture perfect landing, passing over Central America and the western coast of Florida. They and mission specialists Joe Tanner, Carlos Noriega and Marc Garneau spent just short of 11 days in orbit installing the first set of U.S. solar arrays, performing three space walks and becoming the first shuttle crew to visit the station's Expedition 1 crew. This mission was especially challenging, with three spacewalks required to unfurl the twin solar arrays that will provide heat and power for future experiments aboard the ISS. Today's landing was picture-perfect, with weather conditions clear in the early Florida evening. Video clips here. There will be a press conference tomorrow at KSC - watch live at 12:30PM EST. Space Shuttle Endeavour is scheduled to return to Kennedy Space Center, Fla., today. STS-97's first landing opportunity is at 5:04 p.m. CST (23:04 GMT), with the de-orbit burn occurring at 3:57 p.m. CST (21:57 GMT). Preliminary weather forecasts are favorable for landing, but if needed, there is one more landing opportunity available at Kennedy Space Center and three available at Edwards Air Force Base, Calif. The STS-97 astronauts are wrapping up a successful mission to the International Space Station. While at the station, they installed the first set of U.S. solar arrays, performed three space walks and became the first shuttle crew to visit the station's Expedition 1 crew. Watch streaming video of post-landing activities on NASA TV. NASA TV Schedule. Endeavour's five astronauts were awakened by flight controllers to the tune of "I'll be Home for Christmas," this morning. They are looking forward to landing early this evening after a successful mission to the International Space Station. The weather forecast for the anticipated landing time at Kennedy Space Center, FL, 6:04 p.m. EST, calls for a slight chance of showers in the area. Watch the landing live on NASA TV or NASA TV on the Web. On Saturday Endeavour's astronauts made a final fly-around of the International Space Station, then separated from the orbital outpost they had helped make the most powerful spacecraft ever with the installation of a 240-foot wide solar array. Following naval tradition, Expedition One's crew--who will remain aboard the space station until February--rang the station's ship's bell as Endeavour's crew departed. 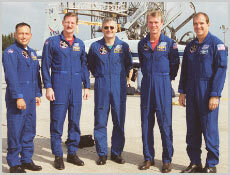 After successfully completing its task at the International Space Station, the STS-97 crew focused on returning to Earth. Most of Sunday was spent preparing for Monday's landing, which is slated for 5:04 p.m. CST (23:04 GMT) at Kennedy Space Center, Fla. Commander Brent Jett, Pilot Mike Bloomfield and Mission Specialist Carlos Noriega checked out landing systems. The STS-97 landing ground tracks for Monday are available. Watch streaming video on NASA TV to see continuing coverage of STS-97. NASA TV Schedule. Endeavour undocked from the ISS over the weekend, completing a "magnificent" mission to "Space Station Alpha". All that remains is a safe landing at Kennedy Space Center. Follow the play-by-play at Florida Today and Spaceflight Now! More news tonight! Endeavour astronauts and the crew of Expedition One aboard the International Space Station finally met face-to-face today, now that all spacewalks on Space Shuttle mission STS-97 have been completed. Landing is scheduled for Monday at 6:04 p.m. EST. On Sunday, beginning at approximately 3 p.m. EST, Univision.com will host the first-ever live Spanish-language interactive online chat with Endeavour astronaut Carlos Noriega. The event, accessible at www.univision.com, will include live audio and video feeds. Participants are invited to submit questions in Spanish prior to the event. A great deal of NASA science information is now available in Spanish from Ciencia@NASA (science at NASA), from the Science@NASA staff at Marshall Space Flight Center. After successfully completing its task at the International Space Station, the STS-97 crew is now focusing on returning to Earth. Most of Sunday will be spent preparing for Monday's landing, which is slated for 5:04 p.m. CST (23:04 GMT) at Kennedy Space Center, Fla. Commander Brent Jett, Pilot Mike Bloomfield and Mission Specialist Carlos Noriega will check out landing systems. They will test the Reaction Control System jets at 11:16 a.m. (17:16 GMT). Also, the entire crew will spend time putting away equipment that was used at the space station. Watch NASA TV to see the Associated Press, Telemundo and Univision conduct interviews with the STS-97 crew today at 2:51 p.m. CST (20:51 GMT). NASA TV Schedule. The STS-97 crew and MCC have answered Internet questions in the Ask the Expert section. Endeavour�s astronauts worked Wednesday to get ready for the Thursday space walk by Mission Specialists Joe Tanner and Carlos Noriega. They also took a few hours off to rest and enjoy the view from their spacecraft, moving at five miles a second about 235 miles above the Earth. Space walk preparations focused on techniques to tighten one of two solar blankets on the starboard wing. They got the word that task had been added to the space walk schedule shortly after they were awakened about 6:30 a.m. They reviewed the procedures during a conference with flight controllers later in the day. Check the Mission Control Center Status Reports for Wednesday morning and evening. At 5:58 p.m. CST (23:58 GMT), STS-97 Astronauts Carlos Noriega and Joe Tanner completed the second space walk of STS-97. 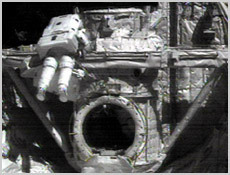 Noriega and Tanner performed tasks to activate the International Space Station's newly installed solar arrays, moved S-band antenna equipment and prepared Pressurized Mating Adapter 2 for relocation to the end of the Destiny Laboratory Module, which is scheduled to be delivered to the station in early 2001 by STS-98. This... space walk lasted 6 hours and 37 minutes and was the 12th space walk conducted outside of the space station. The third space walk of STS-97 is slated to begin Thursday at 10:51 a.m. CST (16:51 GMT). The STS-97 crew has answered an Internet question in the Ask the Expert section. Watch NASA TV Wednesday at 12:16 p.m. CST (18:16 GMT) as Fox News; WBBM-TV, Chicago; and Bob Vila interview crew members. NASA TV Schedule. The Flight Day 5 Crew Activity Report is now available in the Gallery. Check the Mission Control Center Status Reports for Tuesday morning and evening. The STS-97 astronauts completed deployment of the second solar array on the International Space Station's P6 Integrated Truss Monday night at 8:46 CST (Tuesday at 2:46 GMT). The sequence of events in the deployment was a modified version of Sunday's deployment of the first solar array wing. 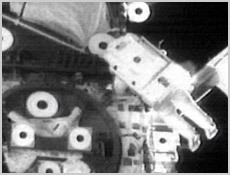 Instead of deploying the array in a continuous motion, the crew stopped the process numerous times to dampen the movement of the solar array blanket. Also, flight controllers continue to look at procedures to increase the tension on the array deployed Sunday. Now that the deployment of the station's first set of U.S. solar arrays is complete, attention turns to the second space walk of STS-97. Mission Specialists Joe Tanner and Carlos Noriega are scheduled to begin the space walk Tuesday at 11:46 a.m. CST (17:46 GMT). Follow the play-by-play at Florida Today and Spaceflight Now! Flight controllers and the STS-97 crew continue to work toward the deployment of the P6 Integrated Truss' second solar array wing later today. The sequence of events in the deployment, which is currently scheduled for 5:23 p.m. CST (23:23 GMT), will be a modified version of Sunday's. Instead of deploying the array in a continuous motion, it will be stopped several times to dampen the movement of the solar array blanket. Also, flight controllers continue to look at procedures to increase the tension on the array deployed Sunday. Also today, the astronauts will do some housekeeping chores on the shuttle and do a photo survey of the solar array structure. Tuesday, Mission Specialists Joe Tanner and Carlos Noriega will perform the second space walk of the mission. At 8:08 p.m. CST Sunday (2:08 GMT Monday), STS-97 Mission Specialists Joe Tanner and Carlos Noriega finished the first of three space walks that they will conduct during the mission. During the space walk, the STS-97 crew installed the U.S. solar array structure. The space walkers received help from Pilot Mike Bloomfield and Mission Specialist Marc Garneau, who were operating Space Shuttle Endeavour's robotic arm. After the installation and preparation of the solar array structure, Commander Brent Jett sent the command to deploy the arrays. However, only one of the two arrays was deployed. The length of the space walk was 7 hours and 33 minutes. The Flight Day 4 Crew Activity Report is now available in the Gallery. Mission controllers are hesitant to deploy the second array until they know why the first one didn't unfurl with enough tension. It is generating electricity, however, and NASA could even leave the "solar wings" in this state - but who really thinks they're going to do that? STS-97 Mission Specialists Carlos Noriega and Joe Tanner began the 11th space walk in the history of the International Space Station at 12:35 p.m. CDT (18:35 GMT). The main objective of the space walk is to attach the solar array structure to the International Space Station. The space walkers will be assisted by Space Shuttle Endeavour's robotic arm, which will be operated by Pilot Mike Bloomfield and Mission Specialist Marc Garneau. After the solar array structure is installed and ready for deployment, Commander Brent Jett will send the command to deploy the arrays. The space walk is slated to end at about 7:16 p.m. CST (1:16 GMT). 02 December 2000 - UPDATE 11:30PM EST - Astronauts Noriega and Tanner entered the "vestibule" of the Station today, leaving bags of water and other supplies for the Expedition One crew to retrieve. The two crews are not on the same sleep schedule, but that will sync up on Friday for joint operations. Flight Day 3 is winding down. Tomorrow's activities will feature the unfurling of the giant solar arrays that will allow the U.S. Destiny module to be opened up, as well as provide power for future station nodes. Destiny has been sealed since the ISS crew has been aboard, because the existing solar panels don't provide enough electricity to keep it heated. Check the Mission Control Center Status Reports for Saturday morning and evening. Space Shuttle Endeavour docked with the International Space Station today at 2 p.m. CST (20:00 GMT) to make STS-97 the first shuttle mission to visit the inhabited space station. While at the station, the STS-97 crew will install the P6 Integrated Truss Structure, which contains the first set of U.S. solar arrays. At about 3 p.m. today [4PM EST], Mission Specialist Marc Garneau will use Endeavour's robotic arm to lift the P6 out of the payload bay. He will park the P6 above the bay so that its temperature can begin equalizing with that of the space station. Also this afternoon, Mission Specialists Carlos Noriega and Joe Tanner will enter the station docking port to install electrical grounding straps and deliver supplies for the station crew. The Flight Day 2 Crew Activity Report is now available in the Gallery. Space Shuttle Endeavour is almost at its destination, the International Space Station. The STS-97 crew will begin rendezvous operations at 8:30 a.m. CST (14:30 GMT) today. Endeavour's engines will be fired twice prior to its docking with the downward facing docking port on the station's Unity Connecting Module. The first burn will occur at 10 a.m. CST (16:00 GMT) and the second burn, which is the terminal initiation burn, will occur at 11:33 a.m. CST (17:33 GMT). Docking is scheduled for 1:59 p.m. CST (19:59 GMT). The STS-97 crew will receive assistance from the station crew with air-to-air radio signals during the approach and docking. Night launches of the Space Shuttle are always spectacular events. The engines and solid rocket boosters turn night into day for a few seconds for miles around the launch pad. NASA photographers captured Endeavour on liftoff last night in a series of remarkable photos. Endeavour is scheduled to dock with the International Space Station on Saturday, December 2, at 2:57 p.m. EST. Follow the action on NASA TV or on NASA TV on the Web. Watch streaming video on NASA TV to see continuing coverage of STS-97. The NASA TV Schedule is available online. The Flight Day 1 Crew Activity Report is now available in the Gallery. Space Shuttle Endeavour continues its pursuit of the International Space Station as the STS-97 crew will spend most of its day preparing for Saturday's docking with the station. Today, Commander Brent Jett and Pilot Mike Bloomfield are scheduled to fire the orbital maneuvering thrusters at about 12:41 p.m. CST (18:41 GMT) and 9:15 p.m. CST (3:15 GMT) to put Endeavour in the proper alignment with the station and to close the distance between the two spacecraft. At 11:30 a.m. (17:30 GMT) today, Endeavour trailed the station by about 12,875 kilometers (8,000 miles). Also, the astronauts will be checking out the systems, tools and spacesuits that they will use to install the P6 Integrated Truss, which contains the U.S. solar arrays, on to the station. The shuttle's robotic arm will be used and three space walks will be conducted at the station. Last night's launch of Space Shuttle Endeavour marked the beginning of a busy mission for its five astronauts and the Expedition 1 crew, the current permanent residents of the International Space Station. The astronauts are delivering the P6 Integrated Truss Segment, which includes the first US Solar arrays and a power distribution system. They will take three space walks to connect the equipment. The 17-ton truss segment is the heaviest and largest element yet delivered to the station on a Space Shuttle. This is the sixth shuttle mission to visit the station, but the first since the Expedition 1 crew took up residence. Docking is scheduled for 2:57 p.m. EST on Saturday. CNN interview with the crew here. Updated media schedule here. Check the Mission Control Center Status Reports for Friday morning and evening. Lighting up the sky with a brilliant glow, Space Shuttle Endeavour lifted off from the Kennedy Space Center, FL, tonight on an 11-day mission to the International Space Station. Mission STS-97's five astronauts will join the three-man Expedition 1 crew already aboard the Station to begin assembly work on the orbiting outpost. The giant solar arrays the crew will install will quintuple the Station's electrical power, enabling future unparalleled research. The arrays are the first of three such sets to be attached to the Station in coming years. Follow the play-by-play at Florida Today and Spaceflight Now!. First Mission Control Center Status Report here. 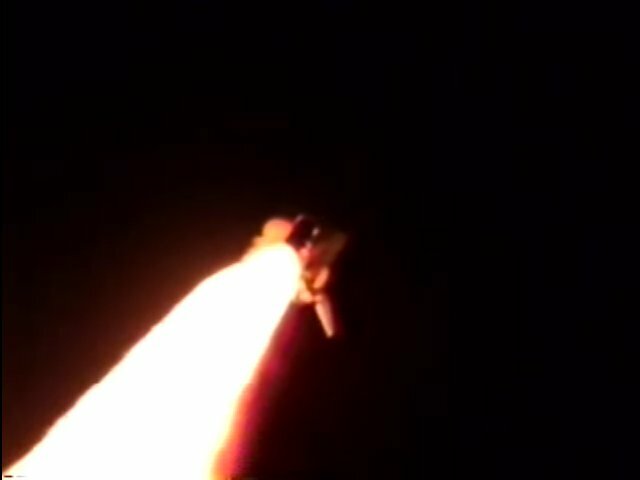 30 November 2000 - 10:50PM EST - Endeavour is firing its Orbital Maneuvering System to make its orbit more circular. Docking with Space Station Alpha is scheduled for 2:57PM EST this Saturday. Did You Know? STS-97 crewmember Marc Garneau became the first Canadian astronaut back in 1984. He is on his third, and possibly final, space flight on the Shuttle. He is the first astronaut from Canada to go up three times. Liftoff, eh? Thursday at 9:06 p.m. CST (Friday at 3:06 GMT), Space Shuttle Endeavour blasted off from Kennedy Space Center, Fla., to begin STS-97. Endeavour and its five-member crew will deliver U.S. solar arrays to the International Space Station and be the first shuttle crew to visit the station's first resident crew. Endeavour is slated to dock with the station Saturday at 1:57 p.m. CST (19:57 GMT). The solar arrays they will install are as big as 2 football fields - and are dangerous to work around. High voltages and plasma buildup could cause electrical discharges - like lightning bolts! 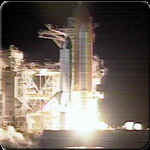 30 November 2000 - 10:10PM EST - LIFTOFF!! Endeavour is on its way to the ISS, on the 101st Shuttle flight!! 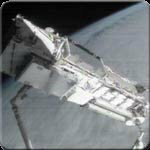 30 November 2000 - 9:50PM EST - Range officers have declared everything safe for launch after one of the transmitters on the ground showed a momentary glitch. We are GO for 10:06PM EST liftoff!! Follow the play-by-play at Florida Today and Spaceflight Now! More news at Houston Chronicle. Shuttle Managers today ordered replacement of one bolt and the repair of another on the Shuttle Access Arm at the Kennedy Space Center, FL. 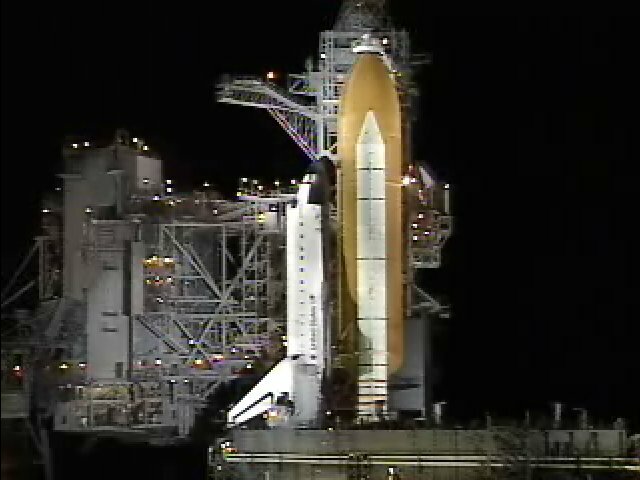 This caused delay in the fueling of Space Shuttle Endeavour, but mission STS-97, with the International Space Station as its destination, is still slated for launch tonight at 10:06 p.m. EST. Watch the launch on NASA TV or on NASA TV on the Web. At launch time, the Station will be located over the southeastern Indian Ocean, west of Australia. At Kennedy Space Center, Fla., the replacement of one bolt and the repair of another on the Shuttle Access Arm caused the fueling of Space Shuttle Endeavour to be delayed. However, STS-97 is still slated to launch tonight at 9:06 CST (3:06 GMT). Fueling is resumed this afternoon at 1:51 CST (19:51 GMT). When Endeavour launches tonight, the International Space Station will be located at 24 degrees 80 minutes south latitude and 96 degrees 20 minutes east longitude. The coordinates will place the station over the southeastern Indian Ocean, west of Australia. Here's the most recent STS-97 Status Report. All systems are go for launch of Space Shuttle Mission STS-97 later today from the Kennedy Space Center, FL. Watch the launch--scheduled for 10:06 p.m. EST--live on NASA Television or on NASA TV on the Web. This mission will carry five astronauts to the International Space Station, where they will join the three-man Expedition 1 crew and connect a package of giant solar arrays and other equipment to the orbiting outpost. The U.S.-developed, 240-foot long solar arrays will generate a level of electricity that could power 30 average Earth homes, and is the first of three such sets of arrays that will be attached to the station in coming years. Watch streaming video on NASA TV of the launch of STS-97. Coverage begins Thursday at 3:30 p.m. CST (21:30 GMT). The NASA TV Schedule is available online. Weather conditions appear favorable. Check back with us tonight for more news. At Kennedy Space Center, Fla., preparations continue on schedule for Thursday's launch of STS-97, a mission to deliver solar arrays to the International Space Station. The final flight preparations for Space Shuttle Endeavour's main engines began Wednesday morning, and the activation of the orbiter's communications equipment and inertial measurement units was scheduled to occur later in the day. Thursday, the Rotating Service Structure will be pulled away from Endeavour at about 12:30 a.m. CST (6:30 GMT), and the external tank will be loaded with fuel at about 12:40 p.m. CST (18:40 GMT). Lift off is slated for 9:06 p.m. CST Thursday (3:06 GMT Friday). The launch countdown for STS-97 began on schedule Tuesday at 12 a.m. CST (6:00 GMT) at Kennedy Space Center, Fla. STS-97 will deliver U.S. solar arrays to the International Space Station. Also on Tuesday morning, workers began removing work platforms from around Space Shuttle Endeavour. Tuesday afternoon, technicians were scheduled to activate and test Endeavour's navigational systems. 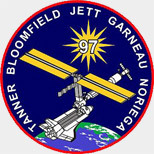 STS-97 is slated to launch Thursday night at 9:06 CST (Friday at 3:06 GMT). The STS-97 flight crew arrived at Kennedy Space Center, Fla., Monday afternoon. Space Shuttle Endeavour and its five astronauts will continue the on-orbit construction of the International Space Station by delivering and installing the first set of U.S. solar arrays. The STS-97 launch countdown is slated to begin Tuesday at 12 a.m. CST (6:00 GMT), and liftoff is scheduled for Thursday at 9:06 p.m. CST (Friday 3:06 GMT). 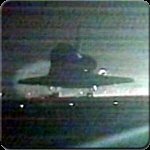 Spaceflight Now has STS-97 preflight videos here. Tuesday night, Space Shuttle Endeavour's payload bay doors were closed as preparations for the launch of STS-97 continued at Kennedy Space Center, Fla. Endeavour and its five astronauts will deliver the P6 Integrated Truss Structure, which contains the first set of U.S. solar arrays. Also, workers complete Endeavour's aft main engine compartment close-outs and were scheduled to install the orbiter's flight doors Wednesday. The STS-97 astronauts will arrive at Kennedy Space Center Nov. 27 at 3:30 p.m. CST (21:30 GMT), and on Nov. 28, the launch countdown is slated to begin at 12 a.m. CST (6:00 GMT). The STS-97 Press Kit is now available. STS-97 training images and videos are now available in the Gallery. Yesterday's Shuttle Status Report here. 20 November 2000 - NASA has confirmed the Nov 30th launch date for Endeavour. Liftoff is scheduled for 10:06PM EST on a mission to the International Space Station. At Kennedy Space Center, Fla., STS-97's primary payload, the P6 Truss, was moved to the payload changeout room at Launch Pad 39B. Thursday, it was scheduled to be placed into Space Shuttle Endeavour's payload bay. STS-97's five-member crew will install the P6, which will increase the International Space Station's power capability with its solar arrays, on to the station. The STS-97 training images are now available in the Gallery. Preparations continue for the launch of STS-97, a mission to deliver U.S. solar arrays to the International Space Station. Saturday, one of Endeavour's payloads, an IMAX 3-D camera, will arrive at Launch Pad 39B and will be installed into the payload bay Sunday. STS-97's primary payload, the space station's P6 Truss, is slated to arrive at the pad Nov. 14. The P6 contains the solar arrays that will become the largest ever deployed in space. Tuesday, Space Shuttle Endeavour was rolled to Launch Pad 39B at Kennedy Space Center, Fla., where it will begin STS-97, a mission to increase the International Space Station�s power-generating capability with the delivery of the largest solar arrays ever deployed in space. Testing of Endeavour�s three Auxiliary Power Units began Wednesday morning, and launch pad validations are under way. Also on Wednesday, the rotating Service Structure was placed around the shuttle, and main engine flight testing was slated to begin. The five-member STS-97 crew will be at Kennedy Nov. 7-8 to participate in the Terminal Countdown Demonstration Test. Latest Shuttle Status Report here. Space Shuttle Endeavour rolls to Launch Pad 39B at Kennedy Space Center, Fla. STS-97 will deliver solar arrays to the International Space Station and will be the first shuttle to visit the station�s first resident crew. The Shuttle stack finally made to the launchpad after a three-hour delay caused by a problem with one of the tracks on the massive crawler-transporter. Preparations continue at Kennedy Space Center, Fla., for the launch of STS-97, a mission that will deliver the U.S. solar arrays to the International Space Station. 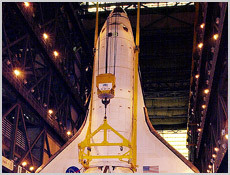 In the Vehicle Assembly Building, workers attached Space Shuttle Endeavour to the external tank and were making final connections on Friday. Saturday, the Shuttle Interface Test is scheduled to begin. Endeavour will be rolled out to Launch Pad 39B on Oct. 30. Endeavour and the five-member STS-97 crew are slated to lift off Nov. 30. STS-97 will be the sixth space shuttle mission to visit the International Space Station and the first mission to visit the station after the arrival of its first resident crew. Space Shuttle Endeavour and its five-member crew will deliver the P6 Integrated Truss Segment, which includes the first U.S. Solar arrays and a power distribution system. Endeavour's robotic arm will be used and two space walks will be conducted to install the P6 on to the station's Z1 Truss. The solar arrays will be the largest ever to fly in space. Also, the crew will relocate the S-Band Antenna Support Assembly from the Z1 to the P6, which will make the S-band system operational. Another payload for STS-97 is an IMAX Cargo Bay Camera-3D. It will be used to record activities of the mission. Latest Shuttle Status Report here. Orbiter processing started back in February.